An adorable card which would make a treasured keepsake of a baby's arrival. This personalised handmade card features a decorated baby pram with a cute baby's face popping up from the pram. 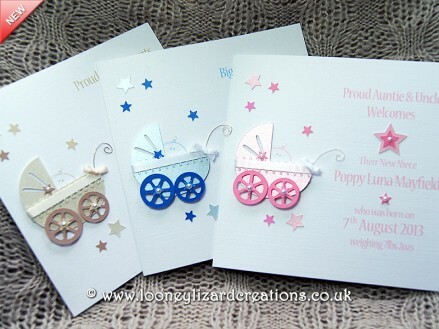 This handmade new baby card uses high quality pearlescent and textured board, ribbon, pearl effect beads and wire detail. 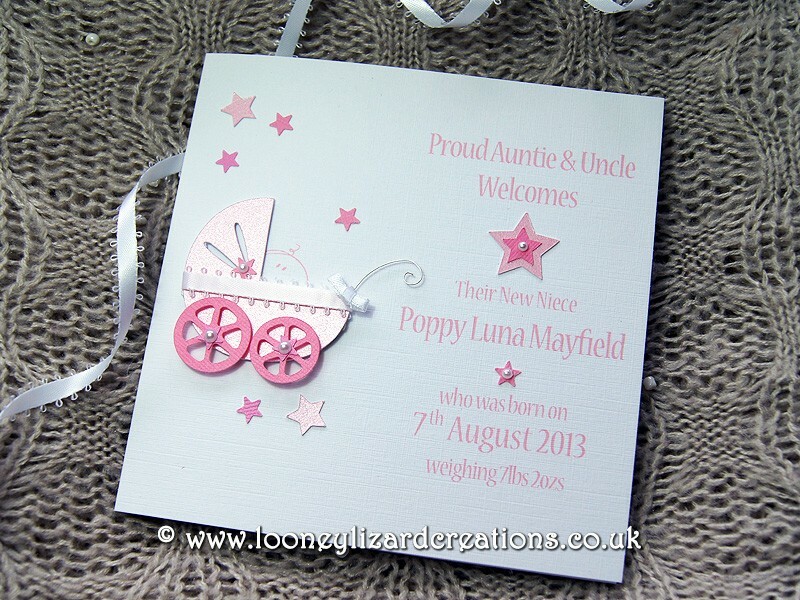 To finish a splatter of different tinted hand punched stars surround the baby buggy. This cute handcrafted card is perfect to send for baby girls, boys or unisex. Why not also use these cards as birth announcements or thank you cards? The standard greeting is 'Congratulations On Your New Bouncing Baby ’. Please see personalisation options above if a different message is required. Ordered the card for my new Grandaughter and not disappointed with the quality. A beautiful personalised card.A very special keepsake. I ordered two of these cards and was delighted with them both! They really are lovely! The recipients wanted to know where I had ordered them, as they were very impressed. Will be using again. Beautifully crafted and so sweet granddaughter card. Great price and very quick service. You will not be disappointed.